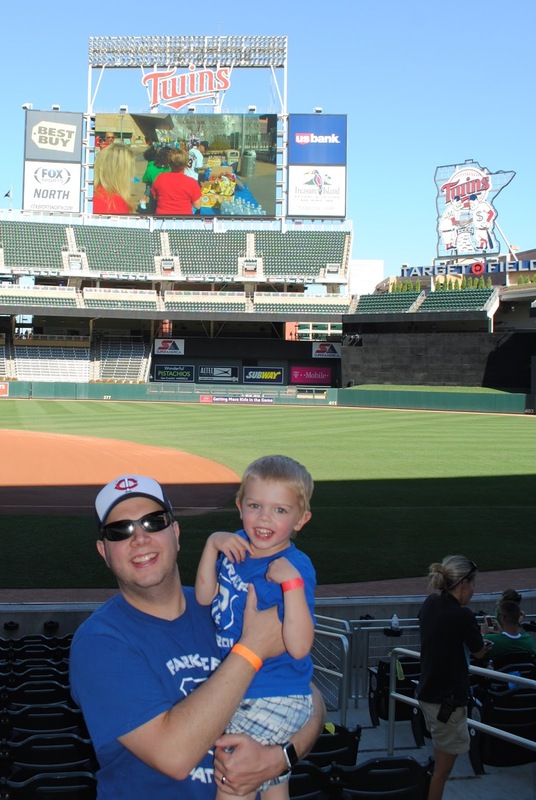 The 2015 Minnesota Walk Now for Autism Speaks was on Sunday. We have participated the last two years and had raised $1800. We set our sights higher this year with a goal of $2000. We had so many generous donations including $1000 from my dad's Lions Club! We didn't even ask for it, which made it even more special. We blew our goal out of the water and raised $2354 this year! I am so grateful for Parker, Jimmy, and our family and friends who have supported us over the last several years. The venue for this years walk changed to Target Field. We were so excited to be out in the sunshine! It was a bit more disorganized, but I am sure they will work out the kinks! We had a great turnout for our team again, 16 members total! Of course the picture where Parker is looking there are a bunch of people hidden. I tried to work some photo magic, but it would have taken a lot of work! 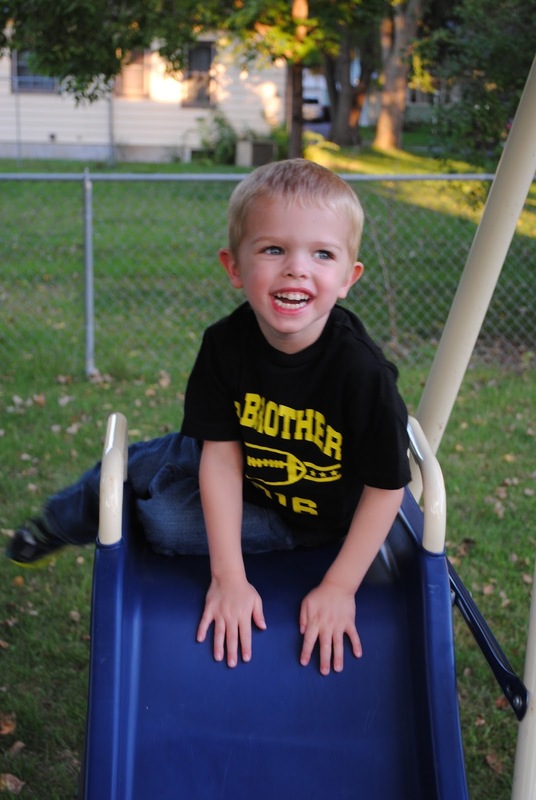 Parker loved being outside surrounded by lots of people that love and care for him. We even made it on the jumbotron a few times! You can see me on the right side with my camera. We had a pretty brief opening ceremony, then walked around the concourse. Parker loved having his buddies join us as well. 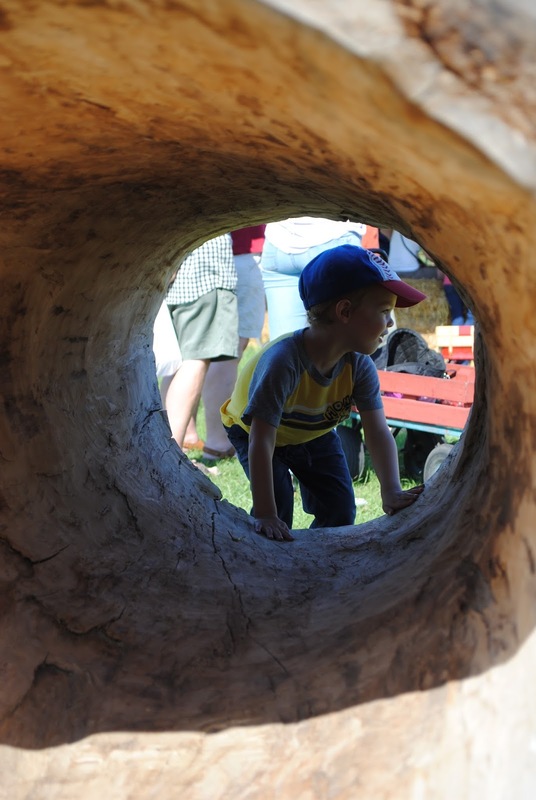 You should have seen the outtakes, as is pictures with pre-schoolers! We will have to set our goal even high next year! Hopefully the weather is just as great! Thank you so much to all of those that supported us this year. You are making such a great difference in so many lives! 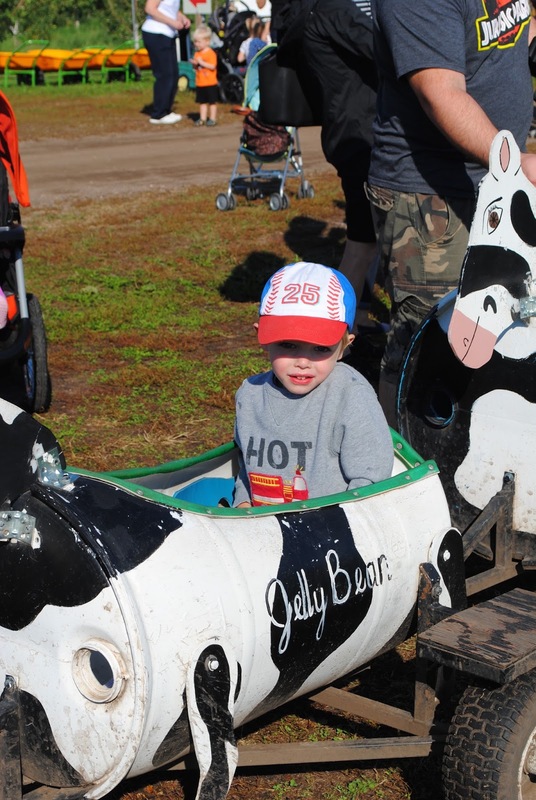 We headed out to Apple Jack's Orchard for some fall fun this morning. 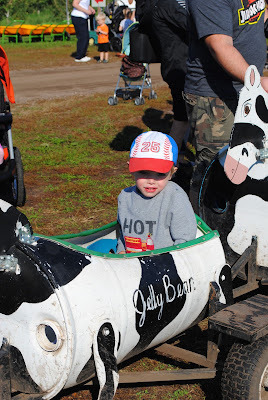 We went there with a group of friends two years ago and have been alternating with Dehn's Pumpkins, where we went last year. I think we will stick to the latter from now on. It is closer to home, less busy, and offers weekday hours. 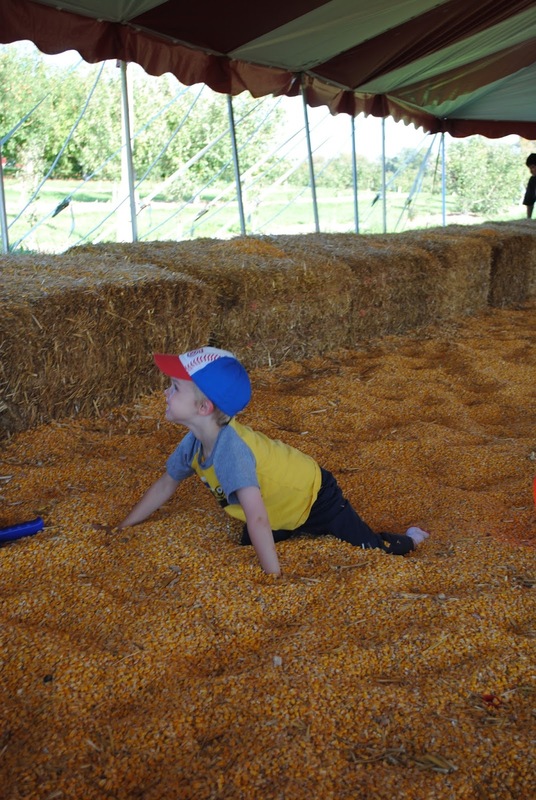 Their corn pit is also a lot cleaner! We had to start the day with some delicious apple doughnuts! Parker enjoyed pushing the pumpkin cart around while I was in the cafe. Total freak-out, melt down. I walked along side for about 25 yards to try to calm him down. There were several other little ones bawling too, so they stopped the train and I was able to grab Parker out. I am glad we tried it, but it took a while to calm him down. We headed towards the corn pit because he has loved that the last several years. He was a happy guy once he got in there. It was really open when we first got in, but was jam-packed by the time we got out 30 minutes later. 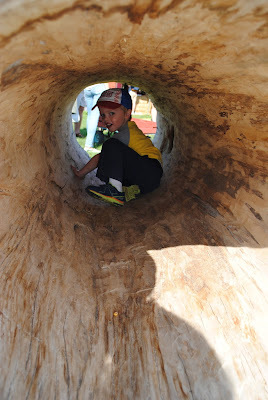 We spent some more time playing and climbing on tires and in logs before heading home. We skipped the apples this time because we were all ready to go home. Can't wait for some more fall fun! 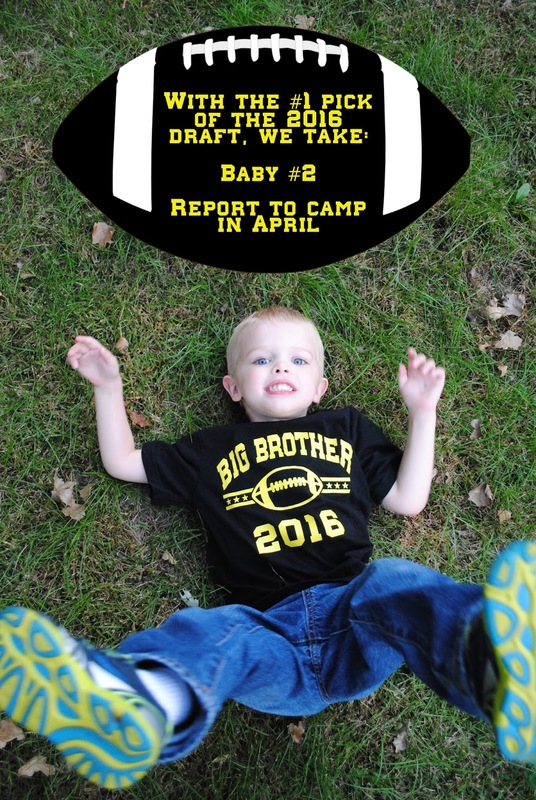 Yes, it's a baby announcement! Aren't you glad I didn't make you wait? Jimmy and I are super excited to announce that we are expecting a baby in April! 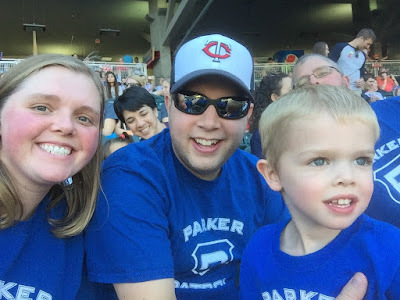 This has been on our minds and hearts for a very long time, but we wanted to make sure Parker's needs were addressed before adding to the family. He has been doing so great and we feel like we have a great handle on his care long term. 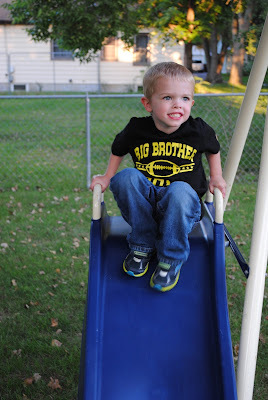 We also decided that having a little brother or sister would be great for him. It will certainly be an adjustment for all of us, but will also help us learn and grow. 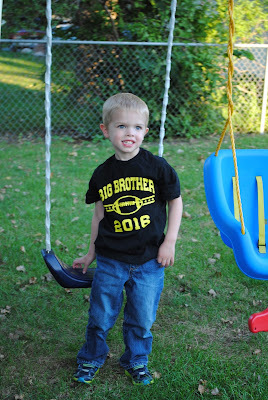 I had to get my craft on and make him a fun shirt! We revealed it to our family and close friends a few weeks and I have been so excited to make it public! He wasn't being as cooperative as I had hoped, but we got one that worked out. Here are some other cute pictures from tonight. I think he was so excited to be outside that it was hard to sit still. 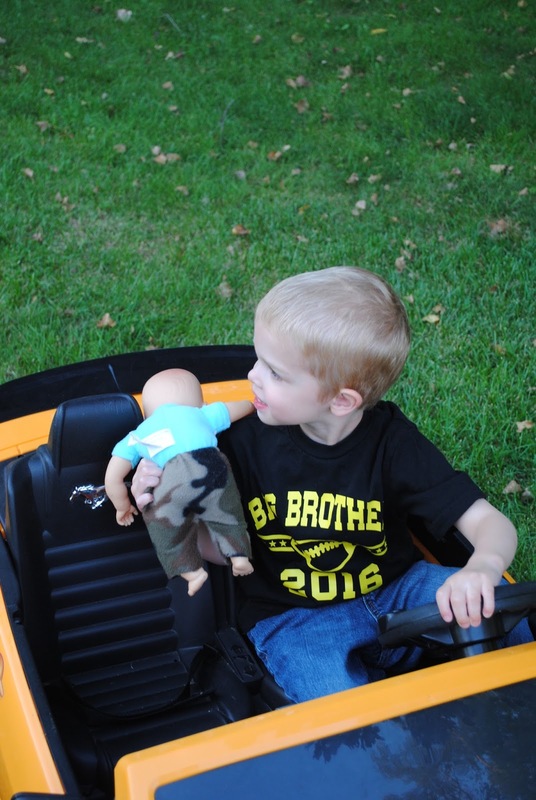 I was hoping to get one of him cruising with his "action figure", Oscar, but he just threw him out of the car! We have been playing a lot with Oscar and Parker calls him "baby." That is pretty much it for now. Officially, my due date is May 3rd, but I will likely go early like I did with Parker, so we are planning for late April. I am feeling great, very few symptoms, which is similar to the first time. I am already on insulin to control blood sugar, which isn't the most fun, but is best for the baby and me. Hope you are all having a great week, I know we are! 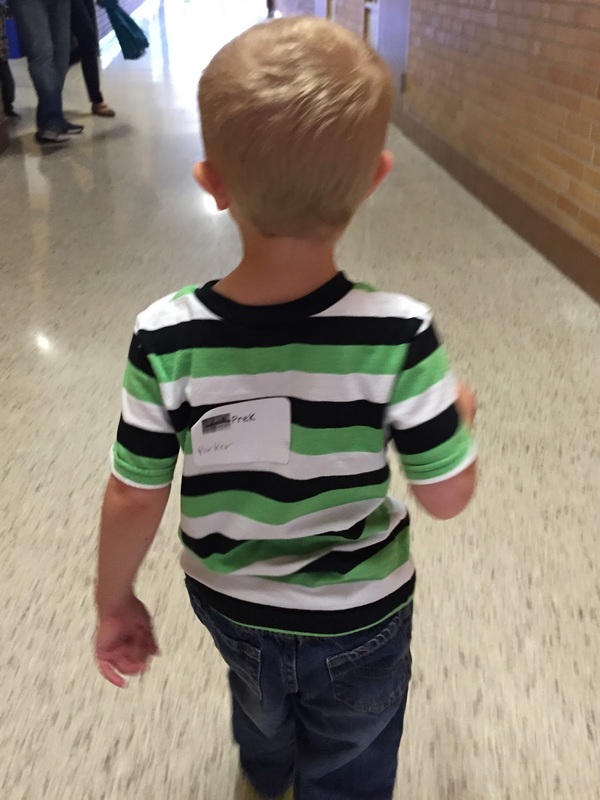 Parker's first day of school was today. 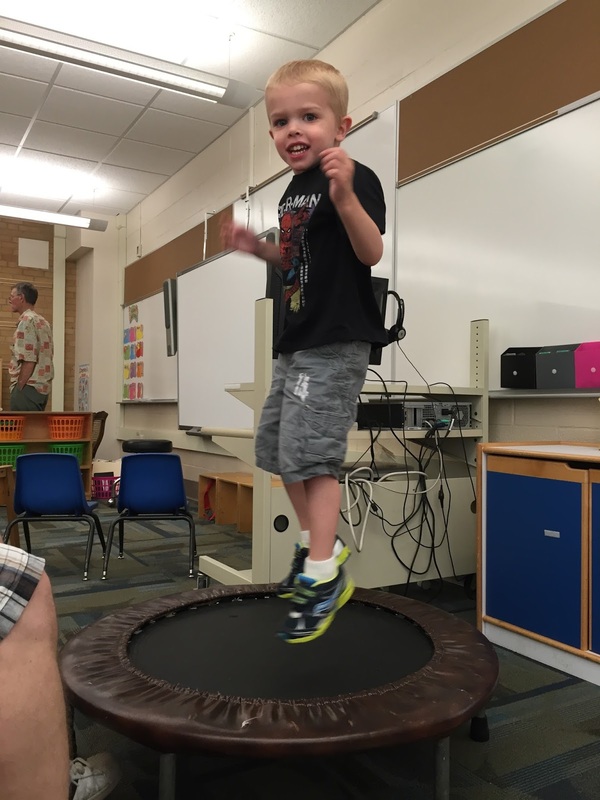 This is his first full year in pre-school and we were all excited for him to go back. 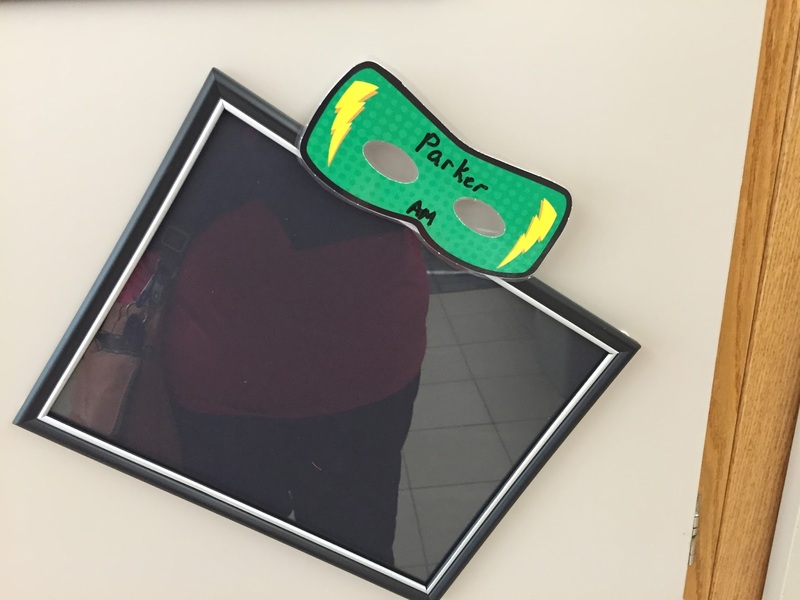 We had an open house a couple weeks ago to meet his new teacher and see his room. He was a little nervous when we drove up to the school, but that wasn't surprising since it had been three months. 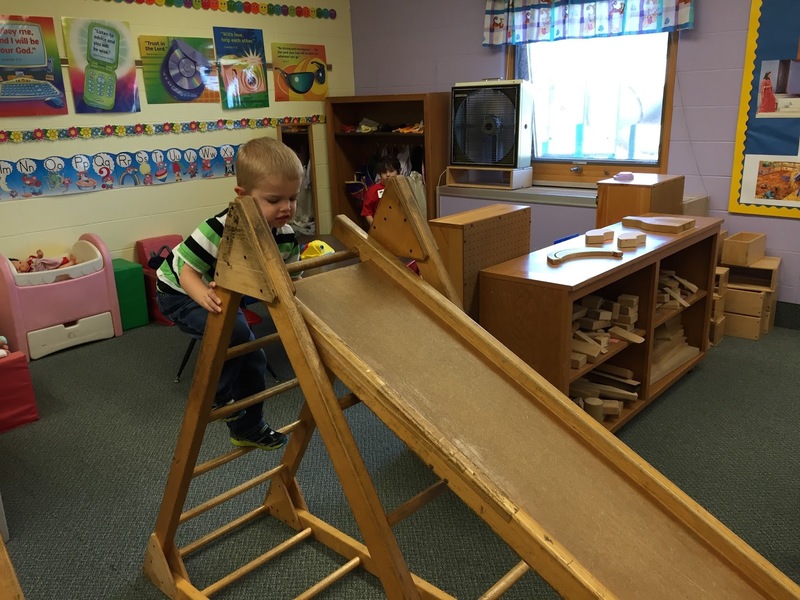 He was in the same classroom and he quickly felt at home once he saw all the toys again. He has his very own locker and a spot on the wall for projects. He burned some energy while we waited to talk with his teacher, Ms. Becky. We got him a pretty cheap backpack last year since that is all we could find in December. The outside looked fine, but the inner lining was starting to rip. We will hold onto it but got him a new one for this year. It was another cheapy because who can resist a $2.50 backpack! He didn't want to put it on, but did sit nicely with it before we headed out. 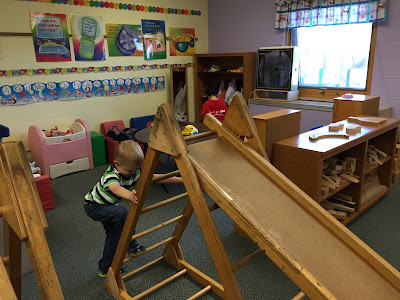 I am sure he had a great first day playing and learning with new and old friends! 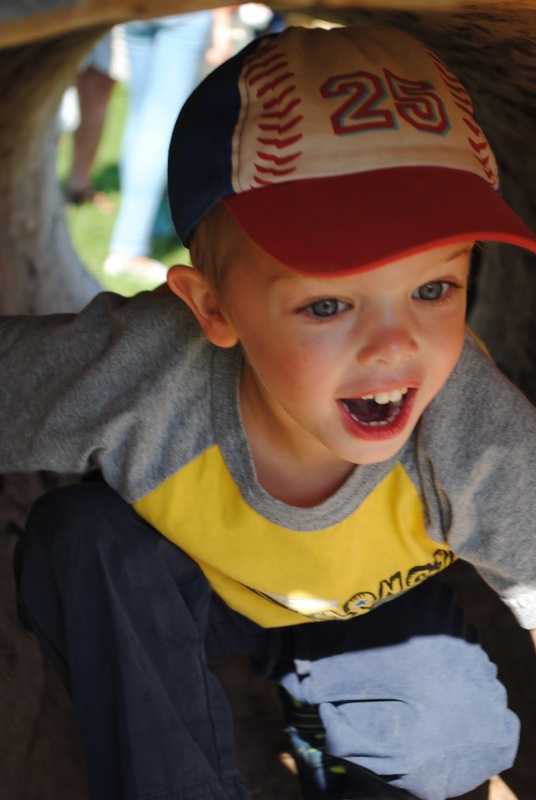 He looks so grown up in this picture, can't believe Kindergarten is just 2 years away! 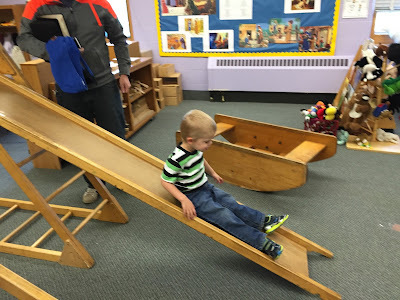 We started attending a new church just before Christmas last year. We go to Saturday services a lot because of Jimmy's work schedule. Our previous church didn't offer children's programming during that service and the room for "energetic kids" wasn't cutting it anymore. We found ourselves having to leave early often. They also ended up removing the Saturday service altogether this summer, which would have forced us to leave anyway. We were also hoping to find something a bit smaller and closer to home. I pretty quickly narrowed in on our new church. It has a Saturday service (with kids programming), is closer to home, and shares a building with a school for kids on the autism spectrum. I thought this could be a great opportunity to meet more people in our direct community as well as make connections in the autism community. There are only two rooms for kids 5 and under, which is much different than our previous church. 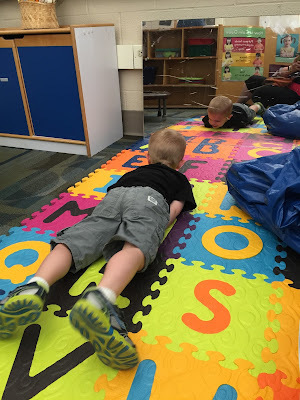 The nursery is for birth-36 months and preschool is for 3-5 year-olds. Parker had just turned 3 when we started, but we thought it would be best to let him try a more relaxed environment since it was a new place. We took him to the nursery and it took several weeks to adjust. 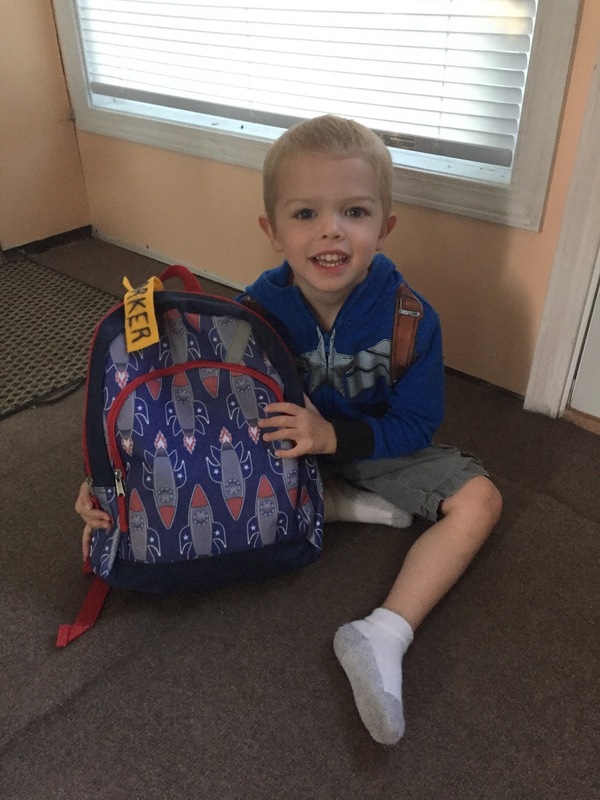 He started school around the same time, so it was a lot of change for a little guy. He would even start crying as soon as we made the exit towards church. By two months in it was like old habit again! That was kind of a long intro, but it leads us to today. It was fall kick-off weekend, so we thought it would be the perfect chance to try the pre-school room. He has been so great at turning left to go to the nursery that we weren't sure what he would think about turning right! He didn't want to go in the room at first, but once he found the toys and slide he was fine. He had so much fun and we are so proud of how he transitioned. It is so strange to see the "Pre-K" on his name tag. I guess he really is growing up. There was a big carnival after the service as well. 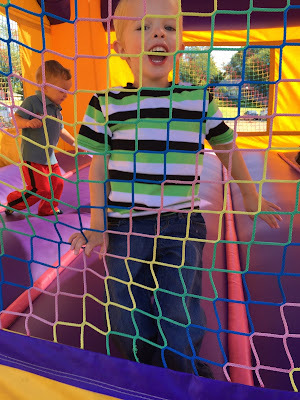 They had a few bounce houses, sno cones, popcorn and face painting. 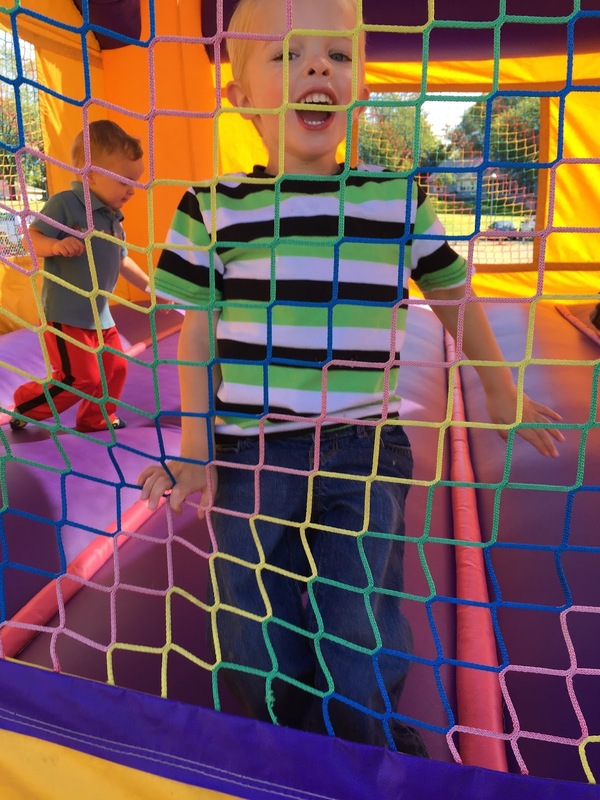 Parker has loved bounce houses in the past, but mainly likes going in and out. He did that a lot, but spent much more time inside! This burned a ton of energy and made nap time a breeze. Natedogs was also there! 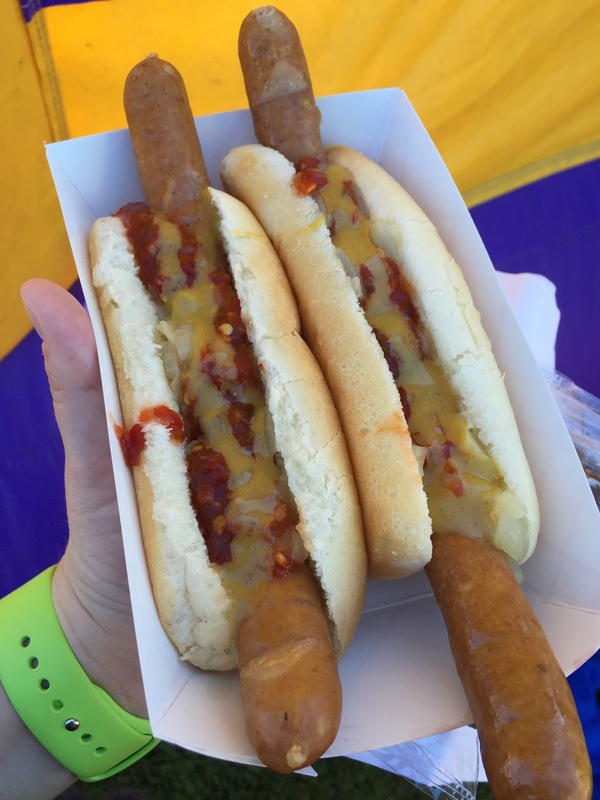 The owner is married to our church worship leader and was providing delicious dogs for the whole weekend. I have been itching to try them ever since I saw the truck in the parking lot. He uses locally sourced meats and even makes his own toppings (no ketchup here!) They were well worth the wait! Parker probably thought today was the best day ever because we went to Perkins for dinner (pancakes!) and the park. He surprised us again by climbing up the big ladder and going down the big slides with minimal encouragement. This isn't our standard park, but will have to come here more. 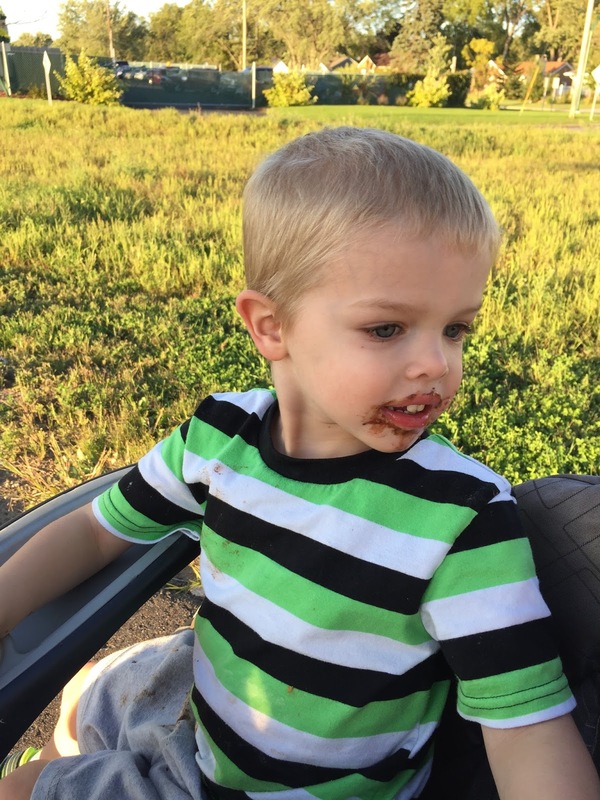 He got his Perkins cookie on the way home. We didn't realize how big of a mess he made until we were almost home. At least there is no doubt he liked it! It was a great Sunday for us, how about you? We haven't had a real date night since July since we went to Winnipeg and the State Fair. It was Jimmy's turn to plan, so he decided we would head to Lake Calhoun for dinner and a walk. Jimmy has been eyeing up the My Burger menu for a while! It is just off the lake, so it was a perfect dinner spot. 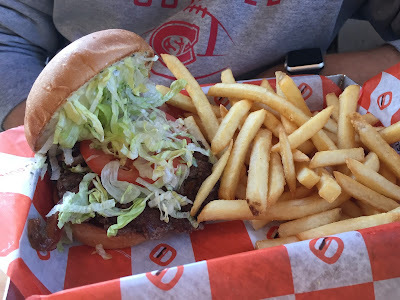 I got the special, BLT burger. 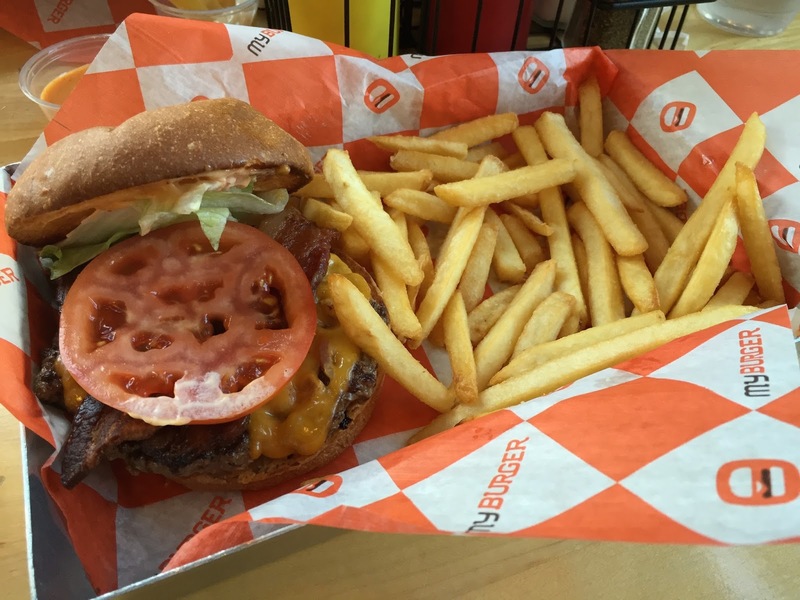 Thick cut bacon, bacon cheddar, and bacon mayo was the perfect trifecta to top this one! Jimmy got the basic bacon bleu. 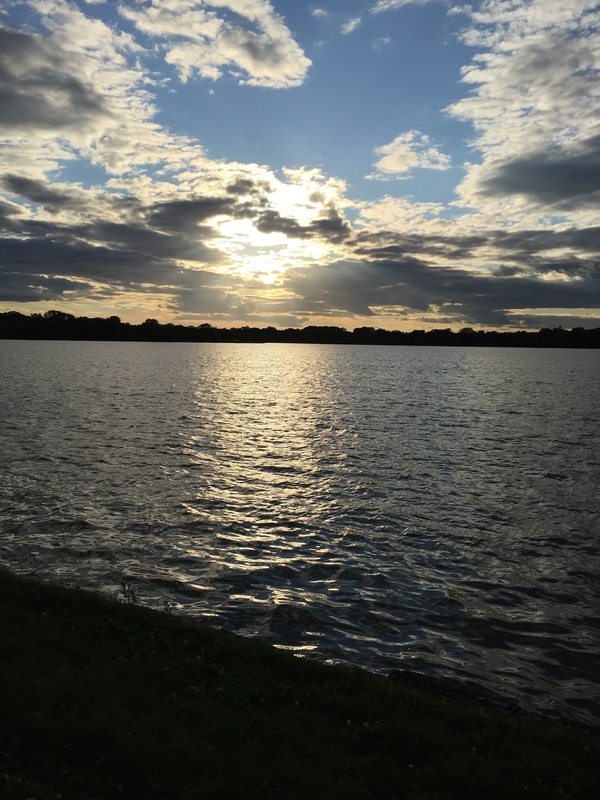 It was a perfect night for a walk around the lake. It was fitting too, since we were just one day shy of 7 years since Jimmy proposed to me. I had to get a picture with the bench where it all happened. We walked around the whole lake, 3.1 miles. Parker was getting a bit antsy by the time we were finished and didn't want back in the car. 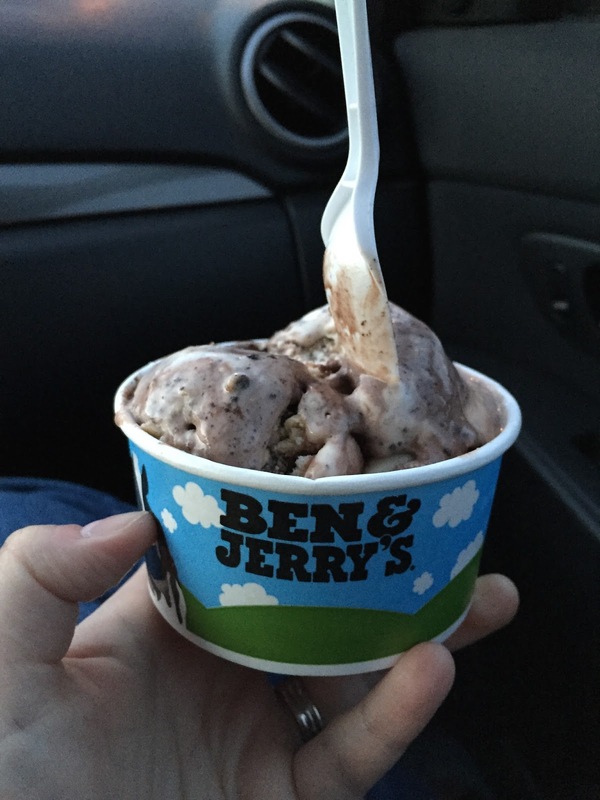 We finished the evening with a bowl of "The Tonight Dough" from Ben and Jerry's. We stopped there before Jimmy proposed 7 years ago. I wish I could remember what we got! This was delicious none the less and make for a perfect night cap. I have been MIA for a couple weeks. Not because nothing has happened, but because we have been really busy. Labor day weekend was fun and relaxing, a much needed 3 days off! 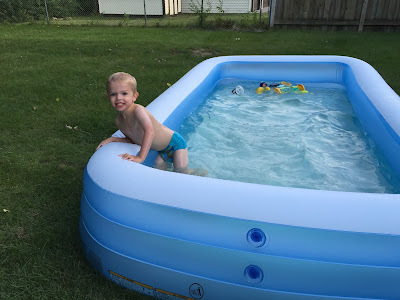 It was hot and steamy so we made sure to get out in the pool! This will likely be the last time it is up this year. 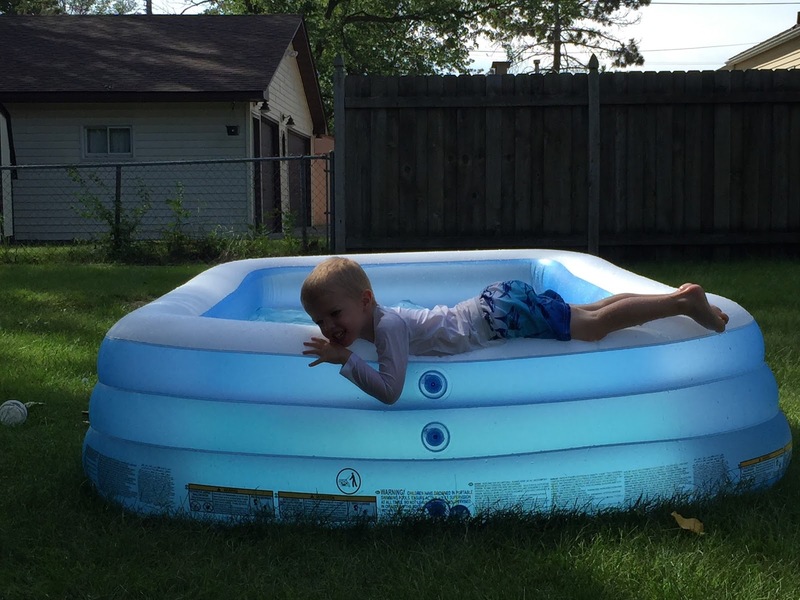 I think Parker could spend the whole day in his pool. 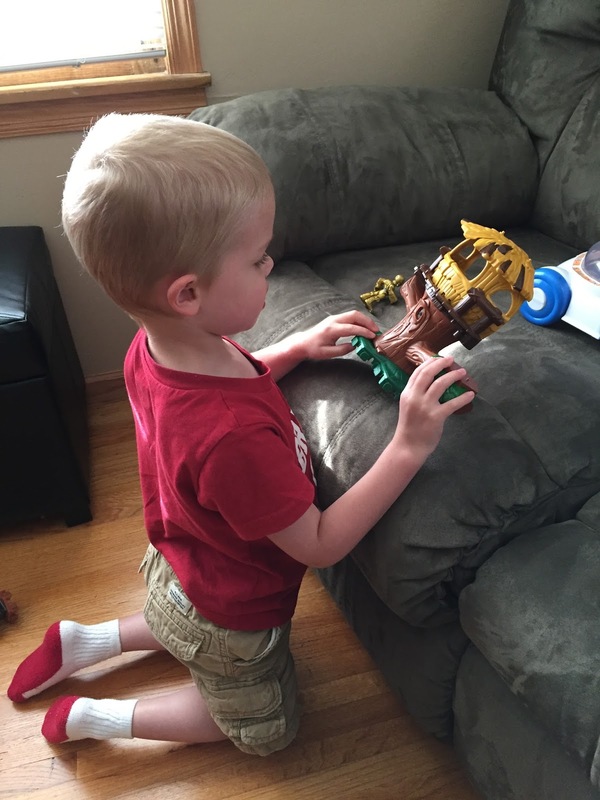 He looks at it longingly from the house and even had a minor meltdown when we got home from church. He was a bit upset that he had to eat dinner before swimming. He didn't pay much attention to the characters, but loved the Ewok tree house. We headed to my parents house on Sunday evening for dinner. We usually do a big campfire and cookout, but the skies were thinking about storming so we hung out inside after dinner. We spent Monday at home, just lounging. A perfect kick-off to fall.